The Flat12 team is excited to announce we have changed ownership, as we welcome Books & Brews owner, Jason Wuerfel, our new CEO. The Flat12 production team, led by our Head Brewer, Sean Lewis, has been contract brewing Books & Brews’ beers for the past two years, so it was a natural move for our organizations to join forces. Aggressive adaptation is necessary in this increasingly competitive craft beer landscape, and the move will allow both of our companies to continue to produce the beers, events and ambience our consumers have come to love. "As Books & Brews grew, we got to a critical point where you start to look at the numbers," Wuerfel said. "Really, the purchase came out of our relationship with the brewers there,” said Jason Wuerfel. Consumers are unlikely to notice any changes to either of the establishments as a result of this acquisition. Current staff for both businesses will continue on to lead their respective brands. Core beer portfolios will remain unchanged and we will continue brewing innovative beers and hosting the quirky events and community initiatives that put us on the map. “We are excited to welcome Jason, and the entire Books and Brews team to the Flat12 family. Flat12 will continue to produce the beers and events our community rallies around. Our breweries will collaborate to continue to make high quality, exciting beers, in a wide variety of beer styles,” said Marketing & Events Director, Valerie Green. Flat12’s Eighth Anniversary Beer Festival is set for Saturday, January 26th, and will serve as a celebration of our history and new developments! 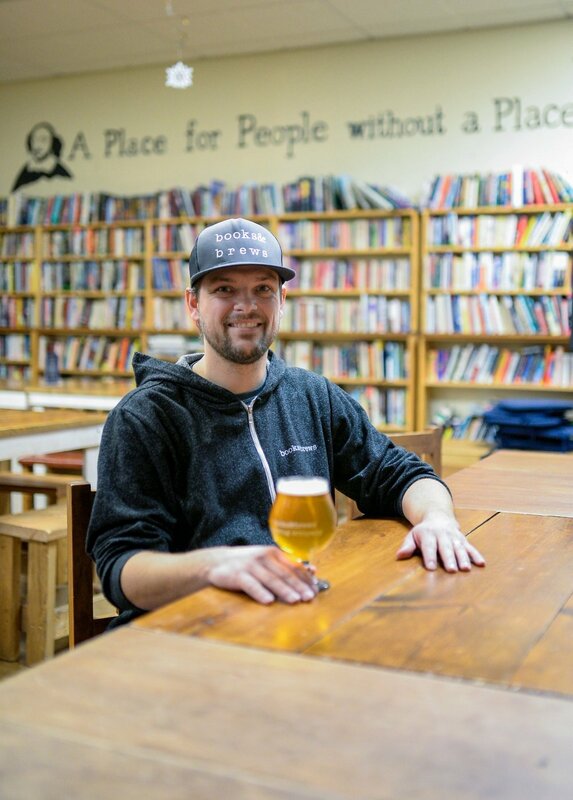 Books & Brews opened its first store in Indianapolis, Indiana in March, 2014 with a simple mission in mind: provide a place for people without a place; where all are accepted, appreciated, and encouraged to be themselves. Founder and Chief Executive Officer, Jason Wuerfel was a stay at home dad of his then newborn daughter when he started brewing his own beer at home. Mr. Wuerfel will be the first to tell you that he didn’t know anything about brewing beer, but with everything he does, he set out to find the best recipes and practices to brew that special beer. As he was at home, beginning to perfect his beer recipes, he began to dream about a place that welcomed everyone in its doors, regardless of background. Coming from an entrepreneurial family and having a deep love for books, games, video games, and beer, the idea of Books & Brews was beginning to emerge. We love trying new recipes with all of our core beers, and here's one of our favorites with our Walkabout Pale Ale, a single-hopped pale with Galaxy hops from Australia! The hoppiness of the pale ale shines through in this soup. A pilsner will tone it down, but not completely. If you are looking for some sweetness, add honey or granulated sugar. The brewery recently purchased the canning line from the industry’s leading canning machine maker, Wild Goose, based in Boulder, Colorado. Wild Goose canning solutions are “tailor-made and precision engineered to meet each customer’s individual needs.” Wild Goose hand-builds every system in their Boulder, Colorado facility using American-made parts. In addition to the canning line, Flat12 is one of the first breweries in Indiana to purchase and run a Tri-Pack shrink sleeve application machine utilizing a steam tunnel system in tandem with the canning line. According to Tri-Pack, “Heat shrink sleeves and labels are a fast growing trend in the craft brewing industry.” Tri-Pack’s cutting edge system enables a quick-to-market product launch opportunity to craft breweries. In addition to core beers, the new can sleeving machine will enable Flat12 to nimbly can small batch and specialty beers. The craft beer consumer has a growing awareness that cans are better for beer because they prevent exposure to light and form an airtight seal preventing oxidation, both of which can negatively affect quality and taste. With the addition of the complete high-tech can production system, Flat12 will be making the switch from 12 oz bottles and 16 oz cans, to all 12 oz cans in Spring 2017. “We’ve worked really hard at pulling all the logistics for the new equipment together, and we’re looking forward to seeing it up and running. We’re going this direction to increase the quality of our product and to provide our customers an even better experience with the core and specialty beers we create,” said Head Brewer, Sean Lewis. The brewery will immediately begin canning all of their year-round flagship beers including Half Cycle IPA, Walkabout Pale Ale, Upside Down Blonde, and Pogue’s Run Porter. The first specialty brew to hit the Flat12 canning line will be the popular spring/summer offering, Hinchtown Hammerdown Pilsner, brewed in collaboration with Indy Car driver, James Hinchcliffe. Consumers can expect a variety of other limited release canned beers going forward. Flat12 Bierwerks is a production craft brewery formed in 2010 located in the fast-growing Holy Cross neighborhood— just east of downtown Indianapolis. The ingenuity of Flathead 12 cylinder engine revolutionized racing in the great state of Indiana. They foster that same spirit of ingenuity with every beer they create. Flat12 currently distributes across Indiana and Louisville, and in 2015, opened a second location on the Ohio River in Jeffersonville, Indiana, just across from downtown Louisville. Download hi-res photos and video of the new system in action HERE. With heavy hearts, we thank everyone who has reached out with kind words and remembrances of Sean Lamb (also known as News.) We have lost a very dear friend and member of our Flat12 family and our hearts go out to his family in this painful time. As a celebration of Sean's life, we will be hosting a private memorial at Flat12 on Sunday, February 19th at 7:00p. All friends and family are welcome. All beer sales from the evening will be donated to Sean's family to help with arrangements. Join us at 414 Dorman Street, Indianapolis, IN. Our team is currently working on brewing one of Sean's fantastic small batch beers to release in his honor. Details on the release forthcoming. We'd love to have any photos of Sean to include in a memorial slideshow in the taproom. Please email photos to HERE. We're looking forward to our biggest event of the year! Thanks for joining us! In order to avoid long lines the day of the event, beginning Wednesday, January 18th, sample package ticket holders can pick up their wristbands, glassware, and gloves at the Indianapolis taproom between the hours below. MAKE SURE TO BRING YOUR GLASS, GLOVES, AND WRISTBAND THE DAY OF THE EVENT. There will be no replacements on hand. Yes, of course. It's a beer festival! Make sure to have your ID for entry. Yes, the party is FREE to attend. We will have live music from The Innocent Boys from 3-4p, then again from 5p-6p, Hoagies & Hops located right inside the brewery will have food specials and their full menu, plus 16 oz pints and half pints of 30+ beers will be available for purchase. Are there free samples of these awesome, limited, super rare beers? 3 oz samples will be included with the purchased glassware & sample package ONLY. Half pints and pints are available for purchase without the package. Buy the sample package HERE. How does the glassware & sample package work? If you purchased the glassware & sample package you will receive a commemorative 11.5 oz Rastal Teku glass, Flat12 branded touchscreen gloves, and 3 oz. samples of 30+ beers for the duration of the event. Please bring your ticket and ID with you and check in at the station in the beer garden upon arrival. If you have purchased a package, you can pick it up early beginning Wednesday January 17th during open hours. If a package is not purchased, attendees may purchase half pints and pints of any beer, but samples are not included. Will the glass & sample packages be available at the door? We're close to selling out, so we suggest getting them while they're available in advance HERE. We highly recommend taking Lyft or Uber to and from the event. For your designated driver, there is plenty of free street parking around the brewery. Check out the map below. It's a beer fest with lots of high gravity beers to enjoy, so please plan on eating! Hoagies & Hops is the new east coast style hoagie shop located inside the taproom. They’ll have their full menu, and a variety of $5 five inch hoagies and $7 five inch cheesesteaks. Another note: Please stay hydrated. There will be free water stations located at each beer station around the brewery and taproom. What's on the beer lineup? See the epic beer list and choose your own adventure HERE. If you haven’t heard the The Innocent Boys, they’re great drinking music! They’ll play two sets; from 3-4p, then again from 5-6p. Are there any special bomber releases at the event? We're glad you asked! We are very excited to release our Official Sixth Anniversary Beer, a Buffalo Trace Bourbon Barrel aged Pogue's Run Porter (qty 220) and a super special Maple Barrel Aged Pinko Russian Imperial Stout (qty 80) both in hand wax-dipped bombers with custom cherrywood labels. These bombers will be on sale first come first served, so get here early to ensure you get one! Any other questions, please contact Valerie Green, Marketing & Events Director. She's here to help! 2017 is right around the corner and we're ringing in the New Year with a special bomber release this week! A brand new barrel aged brew crafted by Head Brewer Sean Lewis in celebration of a New Year, our Bel-Gin 12th is a traditional Belgian Tripel aged in gin barrels. Pouring a deep gold color with a dense, creamy head, bright herbal qualities complement this balanced tripel. Candy sugar lends a light sweetness to a smooth, boozy finish. Enjoy this brew now or later as Bel-Gin 12th is suitable for cellaring in hand wax-dipped 22 oz bombers. Looking for the perfect holiday gift? Stop by the taproom and check out our stock of brand new merchandise just in time for the holidays. You'll find new mens and ladies t-shirts, barrel pint glasses, hats, stickers, sunglasses, and of course, great craft beer in growlers, cans, bottles, and bombers. Pick up a Flat12 VIP Mug Club Membership for yourself and a friend. You can also take advantage and save with our gift card special. Buy a $25 gift card, get $5 free, or buy $50 and get $10 free. We've got the best deal in town with our daily Pint & Package special. Buy a pint of any house or seasonal beer (including Lacto-matic Milk Stout,) and get a 4 or 6 pack for only $10. Enjoy a pint and pick up a six pack while you're shopping. Cheers and Happy Holidays!